Let's your customers create DB-queries without SQL! Supports Borland Delphi 4, 5, 6, 7, 2005 and C++ Builder 4, 5, 6. 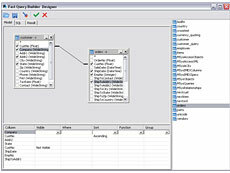 Displays query’s visual model for use and editing.